More often than not, the big talk about Africa focuses on the development of our beautiful continent or the lack thereof, missing out on the quiet moments of daily lives of Africans and the hidden nuances that make Africa tick. 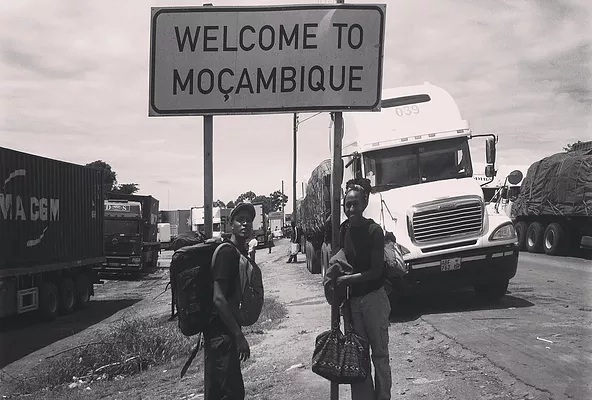 That’s exactly what compelled two photographers to embark on an expedition, documenting the daily city life in all 54 African countries over a period of five years. How did you guys meet and begin working together? We met in 2013 in Nairobi at Kuona Trust. It is here where we connected immediately and began discussing ideas of probably traveling across Africa. Somehow, the idea of African cityzens emerged from our frequent conversations and that’s how we began working together. It’s an inspiring project you guys are doing. What compelled you to start African Cityzens and when did it begin? African Cityzens came into life with the idea of bringing creative common minds together to discuss the story of Africa. What is Africa? Who is African? Are Africans in a foreign continent? How foreign is Africa to Africans? These are part of the stories we are talking about in this trans African art project. What do you hope to achieve with the initiative? To create a body of work that will provoke, rejoice and celebrate the ways of Africa. 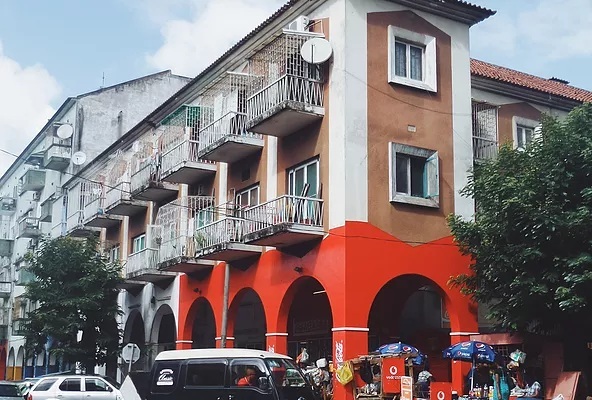 African Cityzens is a trans African art project that incorporates photography, text, and performance art as mediums of study, of the society we live in. Coming from two separate backgrounds, Sarah and I have collaborated to traverse the continent in a bid to develop work that will necessarily portray Africa in its entirety and life from a very contemporary point of view as opposed to the mzungu [East African word for white person] perception. One of the recurring themes in our work is the complexity of black identity, movement and space that define us. In our current work, we are looking into the relationship between freedom and space. It is difficult to come to terms with the fact that the two are interconnected. 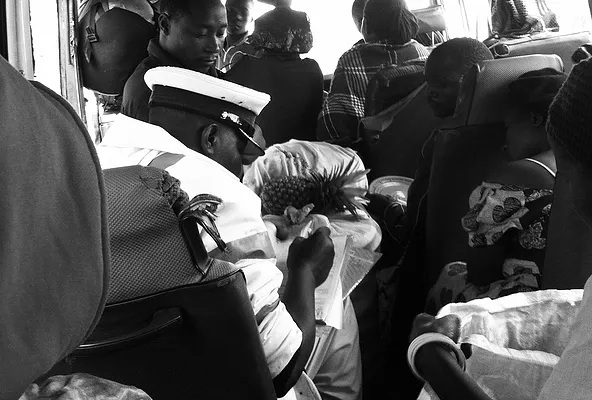 Minibus in Tanzania flagged by a cope (in white hat) due to overloading. 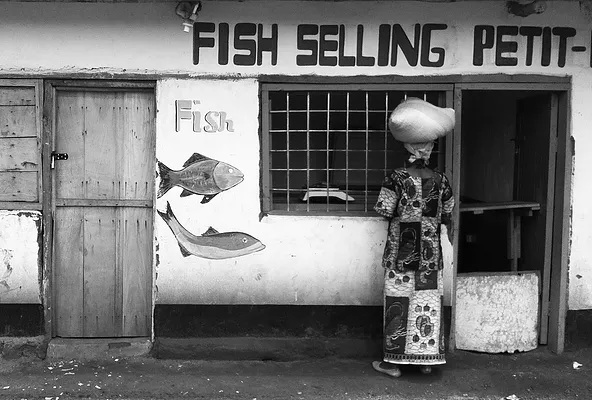 Woman waiting to be served at a fish joint in Dzaleka Refugee Camp in Malawi. 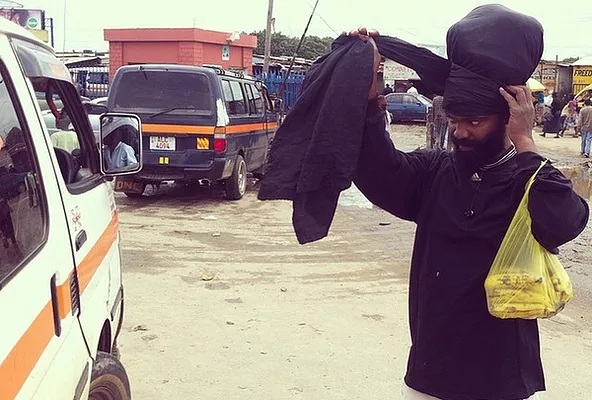 Renowned Zambian artist, Tom Phiri, re-wraps his headscarf to protect his locks in the reflection of a public transport van in the city. Why is it important for us Africans to travel our own continent? Most of us have been westernized to the fact that we are ashamed or don’t know how to speak our mother tongue but happily accept foreign languages as our very own. It is important for us Africans to intermingle amongst ourselves so as to enrich the values and cultural aspects of being Africa. What has been your most memorable experiences travelling from city to city through the continent? There is so much diversity across Africa and for this East Southern leg. We were overwhelmed by the beauty of Harare and its people. I must say Zimbabwe has the most kind and welcoming people. What challenges have you faced in your travels? There are always ups and downs when traveling, especially to places one has not been before. Truth of the matter, one just has to find possible ways of adapting and getting integrated into the life. What have you learnt from your interaction with various cultures and people from different backgrounds in different African countries? While moving around and interacting with various cultures, we’ve been reminded over and over about our “Africaness”, where Africa needs to assert itself with the context of its diversity. Travelling from one country to another must be expensive. How do you fund your trips? Well, the perception has been so, but we realised how cheap it was traveling while using public transport. That’s the affordable option of traveling Africa. One also needs to connect with the locals to identify good and safe places to eat and sleep. Besides that, the worrying bit of traveling Africa has been the bureaucratic border and visa policies that restrict many from traveling. We basically fund our trips by saving up through organising photo exhibitions. We are currently working on a photobook that will narrate the African Cityzen. How would each of you describe yourself? Joel: I am simply Joel Lukhovi, Kenyan. African by blood, spirit, and soul. Sarah: I am a free spirit and a wanderer. I am passionate about Africa and its stories and about telling those stories.